: You may put a green creature card from your hand onto the battlefield. Activate this ability only during your turn, before attackers are declared. 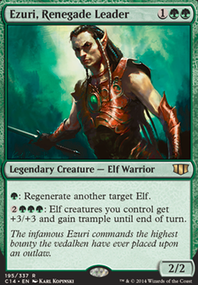 I run Elfs in my Insect Decks, My Favorite ones are Mono Green, So you sorta need them. Ill unlock a couple so can take look at what i like. But for starts, some Key Cards in Mana Elfing/Card Elfing.. Norwood Priestess Gaea's Touch Caravan Vigil , And theres more..
joachimjuncher, Hi! I apologize for such a late reply. The reason is that I've been very busy lately. I'm very grateful to you for taking the time to analyze the deck, and card choice! And thanks for your kind words about the deck! I really appreciate constructive criticism and any suggestions, especially from another mono-green player. Viridian Longbow - As you rightly pointed out, it depends on the playgroup. And my playgroup run some realy pesky commanders like Zur the Enchanter, and to be able to destroy them on instant speed is a decent ability, and I try to make the deck as versatile as possible and considering that green is very week in removing creatures, VL seems like a good spell for all those purposes. I agree that its a bit slower then one shot spells, I'll think about it and try to find a good replacement for more tests. What would you put instead of this card? Lifecrafter's Bestiary - well, I added this card not so long ago, and so far it has performed its functions perfectly - draw additional cards, and scry every upkeep. It is good if you draw it in the beginning - you will at least scry every turn, and it is good to have it in the hand in late game, cuz You usualy have a lot of mana and need more gas (cards) for it. And it has a very good synergy with Cloudstone Curio, Wirewood Symbiote. Utopia Sprawl, Berserk, Temur Sabertooth, Surrak, the Hunt Caller - all these cards were in the deck and were tested a lot. All of them work fine with Rhonas, but on one of them I would focus my attention - Utopia Sprawl, this card is super great without a doubt, with a pain in my heart, I cut and I returned it several times to the deck, man, its so hard to decide what to cut! 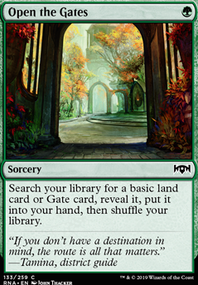 Overgrowth - I'm looking at this magnificent enchantment for a long time, and I would like to find a place for it in the deck, but if I find a slot for it, then I should put Utopia Sprawl first. 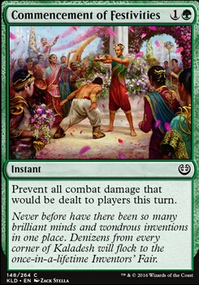 So that if Overgrowth enters the deck, then only together with Utopia Sprawl. Rings of Brighthearth is an interesting suggestion! Despite the fact that the card itself does not do anything when it hits the battlefield, It can create very strong synergies and even infinite combinations. I will definitely think about this. And if I add it to the deck, it makes sense to add Basalt Monolith ;). Homeward Path - I used this card in this deck, and in my other decks. To be honest, the card has never been useful. Yavimaya Hollow - I also like this land, I would like to find a slot for it, it seems to me a great idea to add more protection for creatures. Especially vulnerable are mana dorks, and opponents try to remove them as quickly as possible in my games. 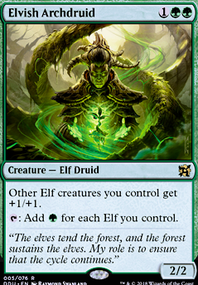 Elvish Archdruid - I absolutely agree that this is an excellent creature. But as for all previous options, its hard to decide what to cut for it. Thanks again for all Your suggestions and feedback! I will be happy to look at your decks to, and try to help with my advice! I enjoy the mechanics of your deck. I have made a very similar one myself, and have tested out some of the cards you play, and found them wanting. However, that depends always depends on the playgroup IMO. Viridian Longbow - While this card seems good on paper with rhonas, it has never given me any real value. As rhonas needs to be first equipped and then tapped to do the shooting, -ideally this means that you have a turn 3 creature shooter where you have spent all ressources up till that point to be able to shoot 1 creature at a time, with everything tapped and nothing to block. Lifecrafter's Bestiary - I have only ever tried this card out in my Karametra deck, but in that extremely creature heavy deck, it was underwhelming, to say the least. What is your experience with that card? Berserk - You addressed this card earlier, and i will say that my experience with it is highly positive. (I play Pathbreaker Ibex as well) With all the draw spells based on creature power, it turns "the Rhonas 5 card draw" into 10 card draw. 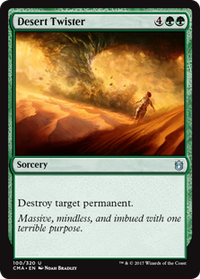 (Greater Good, Life's Legacy, Momentous Fall, Garruk, Primal Hunter) Further more, you can slap it on one of the big creatures like Ulamog, the Ceaseless Hunger, or Terastodon and almost insta kill anyone with leftover HP at that point. Norwood Priestess - Found the Elvish Piper equivalent simply too slow for my taste, I have played around 5-7 games with that dude out, and it has never yielded me anything good. With the amount of ramp cards you play, i would say that this girl could be cut for something more usefull, but ofc, that depends on your own experience as well. 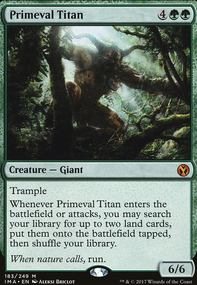 Cards, you might wanna consider:First two, you have already considered and found wanting Utopia Sprawl, Overgrowth. I have tested these cards, and they are overwhelmingly good. Theyre harder to remove than mana dorks, and they provide infinite mana easily with Earthcraft and Cloudstone Curio. Plus you know, they make the Arbor Elf extremely much better. Temur Sabertooth This dude is underated IMO. While he provides another bounce effect, the protection of your key creatures is legit and should be a higher priority i think. With some of the mana doublers in play, he also goes infinite. And he has the added benefit of activating your Rhonas for a measly 4 mana. Homeward Path - I have found, that while having an indestructable commander is all well and good, the worst thing that can happen to this deck is that someone else steals the fucker. In your deck you only have your big eldrazi girl, to get him back (i.e. to command zone then recast]. But it depends on the playgroup i think. In any case it is tutorable with any of your land tutors. Surrak, the Hunt Caller Another haste enabler, which i have found myself tutoring for loads of times to enable combos. He activates Rhonas, and Rhonas in turn activates his haste ability. also. throw out 10 dmg turn 3 is always good for pressurering controldecks. Yavimaya Hollow I love this land, as I will often see players trying to mess with the key mana producers. It is a solid card, and will give you a bit more resilience. Elvish Archdruid I know that you have at some point considered this card. And let me tell you, consider it until you put it in. Do not think of anything else, just do it. Fulfill your dreams and do it. It is cheaper than the Channeler, and provides another easy way to win the game. In all I liked your take on Rhonas, and it look very very much like my own. I have played it in 1on1 Commander and consistently take wins away from aggro and control. The only deck that has the number on Rhonas is Queen Marchesa control. That burns all lower creatures, and sacs Rhonas in a neverending cycle of dominion over our green dorks. Which makes this deck entirely too slow without the added benefit of small dudes. You have received an upvote from me. Good Job. I am grateful for your interest to my deck and your explanations and opinion. I have no doubt about your knowledge in mono green decks. All the cards you suggested are great and I am very familiar with them. All that I wanted to say is that some of them is not so good in this deck, and some "not so good" and even weak cards are shine here especily having Rhonas as commander. Pathbreaker Ibex - he won me many games, he actualy can kill at least one player in one attack having Rhonas by his side. All I am saying is based on my experience playing with this creature. Comparing him with Blightsteel Colossus Colossus has its weaknesses in this build, starting from super high cmc and the fact that it cant be cheated by Norwood Priestess and Natural Order. Triumph of the Hordes was in the deck for a couple of tests. But I'm allergic to "infect" mechanic and trying to win with pure combat damage. But anyway, Your explanations and reasons convinced me to change Pathbreaker Ibex and test something else (maybe Recycle?). 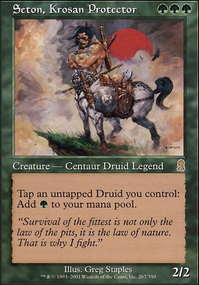 Sorry but I just cant cut Traverse the Outlands this card is super powerful in this deck, You dont need some other creature that makes Travers effective cuz you already have Rhonas (turn 2 usualy online), see this deck with this commander plays a bit different from some other green decks. And Travers can be disrupted, yes (actualy as any spell, and Mana Reflection in particular), considering all enchantment and artifact hate in EDH and super hate Mana Reflection causes it is target number one when it on the table. So, I would prefer having both Traverse the Outlands and Mana Reflection in the deck. I will definitely test Mana Reflection thanks for this suggestion. Exploration is a good card, but not here, belive me, I tested it a lot, and almost always was desapointed. Thanks again for all your advices and help! Elvish Piper was in the deck, and it's a good card. The reason why I use Norwood Priestess instead of Elvish Piper is the difference in speed. Priestess can be activated faster than Piper. Another reason is that Priestess is much more convenient to use with untappers (Quirion Ranger and Wirewood Lodge for example), because you dont need an additional mana for reuse of its ability. And a little bonus - Priestess has in its mana cost for devotion (Karametra's Acolyte, Nykthos, Shrine to Nyx). But I do like Elvish Piper, and I would like to use both of them, Piper and Priestess, I will think about it. Nice deck! 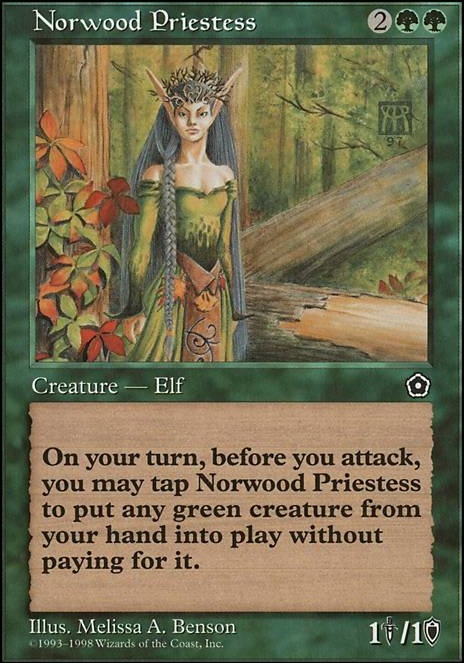 I'd recommend switching the Norwood Priestess for an Elvish Piper though. The Piper can be used whenever you want, while the priestess' ability only works during your own turn.